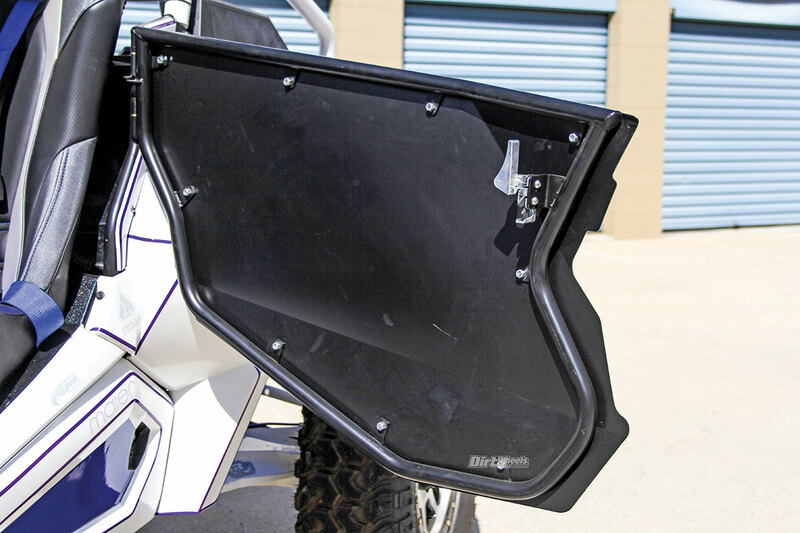 The UTV Inc. doors have sleek styling and offer much more protection than the stock ones. Normally they come black, but we had our RZR wrapped. There are far too many UTV models that come with close-to-pointless quarter doors. Polaris RZRs generally all come with them, and we feel that they’re not enough protection against the elements, brush or trees and accidents. We went to UTV Inc. for a pair of $726 RZR XP 1000/XP Turbo and Turbo S doors. They also make doors for many other brands and models. UTV Inc. builds the main door frame and mounting frames out of TIG-welded steel tubing. 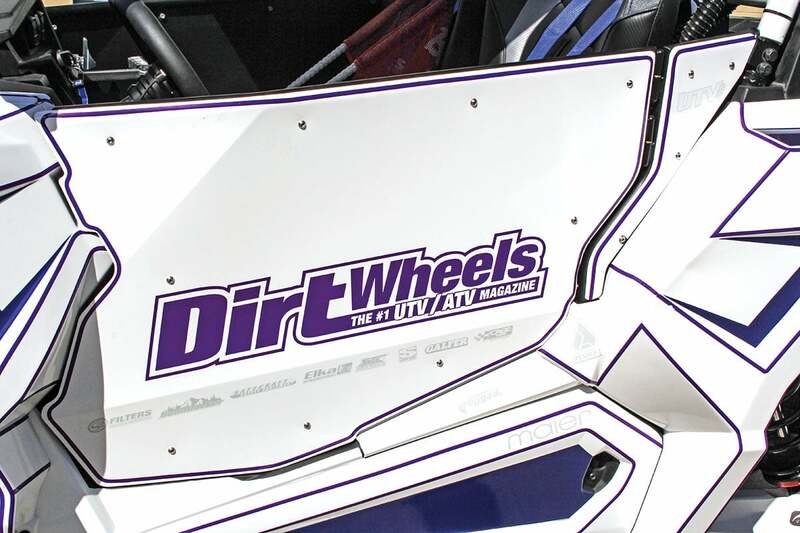 After that they create aluminum door skins that roll over the top frame bar and contour to the RZRs unique body lines. Removing the doors from their mounts takes 10 seconds, but they are not removable when closed. Specialized and secure slam latches are actuated with a large and ergonomic billet release handle. And last, UTV Inc. powdercoats the frames and skins a satin black. The frames of the doors are made from TIG-welded steel, and the aluminum skins are bolted directly to the frame. This part can get tricky if you have an aftermarket roll cage that is difficult to line up and install on its own. We started by removing the stock doors and their mounting brackets. 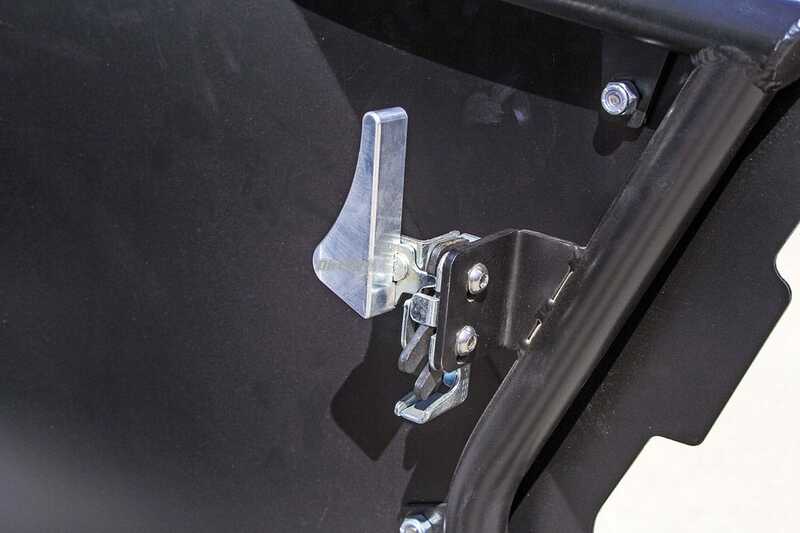 The UTV Inc. doors come with all their own parts and hardware, minus the receiving end of the latches and the roll cage/door frame mounting hardware that must be reused. While installing the new mounting brackets, if you have a stock cage, then you can easily leave the top roll cage bolts loose while also doing so for the bottom mounting bolt. The bottom of the door bracket, as well as the top, have oblong holes so you can adjust and set the bracket to get the doors to fit perfectly. Once you have the brackets bolted in place loosely, you can slide the new doors on them and begin adjusting them properly. The slam latches are heavy-duty and easy to operate. It is best to do this operation with a partner that can hold the door while you set the correct height or drop to fit it perfectly in place. Then you tighten up the bracket/roll cage bolts. Then you can adjust the position of the slam latch to provide smooth operation and secure latching. It took us around an hour and a half to mount the doors. It took that long because our aftermarket roll cage was difficult to mount properly and still be able to adjust one door. Once the installation was complete, we were beyond happy with the doors. They are relatively silent with minimal rattling, they help keep trail debris and mud out of the machine, and look much better than the stockers. Another plus to having full doors is that heat stays inside the cockpit during colder riding seasons. The price tag is a little hefty, but we certainly believe they are worth the cash! Go to www.utvinc.com or call (480) 718-5511 to get more info or order your own set. ATV accessoriesDirt Wheels product reviewsUTV DoorsUTV Inc.